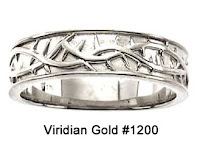 Also a popular style for a wedding ring, the Thorns design can either be viewed as simply a beautiful design, or it can carry a deeper significance of the Crown worn by Christ at His crucifixion, symbolizing His suffering. 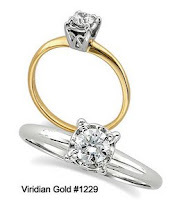 Sometimes this design is found as a "Wreath of Thorns" ring, so-called because the design only wraps around the top portion of the ring, allowing for custom ring sizing (where the "sizing bar" at the lower portion of the ring is made larger or smaller to change the ring size). In some countries of the world, wearing any outward symbol of Christianity is forbidden. So, for instance, if you are a visitor in one of those places, you may not wear a ring which carries a cross. 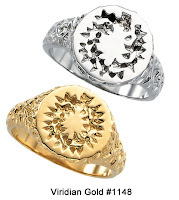 For this reason, many Christians will wear a ring with some other kind of symbol, such as the Thorns design. Not long ago, we sold a matching pair of rings to a woman whose husband travels in Communist China (as a salesman) for that very reason! He was not allowed to enter company buildings with his former wedding ring, which had a prominent cross in it's design. 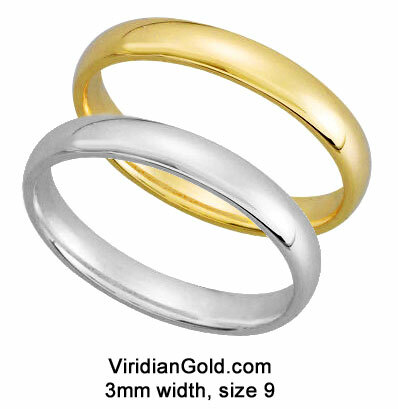 At ViridianGold.com, we carry two styles of Thorn rings. The Wreath style features two intertwined stems of thorns which wrap around the upper 3/4 of the band. 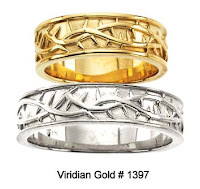 It is available as the economical Sterling Silver Wreath of Thorns Ring , as well as the 14K Gold Wreath version in yellow and white, and in a 10K yellow gold version. The "Crown of Thorns™" style, designed by Brad Ferguson in the early 1980's, is available in both flush and recessed designs, in 14K yellow or white gold. We also carry matching Crown of Thorns™ pendants for this style.